This playground is located within the Arthur Ross Pinetum, a small arboretum that is home to the largest collection of pine trees in the Park. 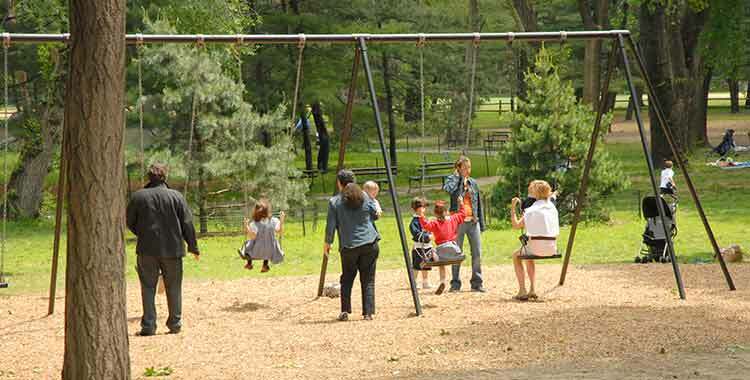 With its open setting (there is no fence), the playground is often enjoyed by adults as well as children. The area also includes picnic tables and open lawns, making it a great spot for picnicking. It is the remnant of a much larger playground that was built in the 1930s. Play equipment includes strap swings, bucket swings and chin-up bars.